Numerous modern day Brazilian Jiu-Jitsu masters declare openly that Rickson Gracie’s Brazilian Jiu-Jitsu is the supreme expression of the art today. Indeed, many world-class Jiu-Jitsu players, champions in their own right, declare solemnly that Rickson Gracie is a virtuoso. The intent of this essay is to speak about my personal experience indicating Rickson’s uniqueness and to pursue several explanations that may shed greater light regarding the source of his matchless skills. One interesting attribute that individuals such as Pablo Picasso, Rudolf Nureyev and Mahatma Gandhi exhibit is entelechy. Entelechy comes from a Greek word meaning “having a goal.” Psychologist Deirdre Lovecky writes: Entelechy is a particular type of motivation, need for self-determination, and an inner strength and vital force directing life and growth to become all one is capable of being. Gifted people with entelechy are often attractive to others who feel drawn to their openness and to their dreams and visions. Being near someone with this trait gives others hope and determination to achieve their own self-actualization. I remember during a Rickson seminar in Salt Lake City hearing him declare his whole philosophy of life revolved around Jiu-Jitsu. Rickson said that Jiu-Jitsu provided him a way of understanding, approaching and enjoying life. However it wasn’t just Rickson’s words that drew people to listen to him, Rickson exuded an aura of supreme self-confidence and self-mastery. Listening to Rickson was like sitting at the feet of an enlightened person or a revered sage. Rickson has that quality we might call presence. The Japanese would say that Rickson has hara. I shared my seminar experience with other students and received the same feedback from them. Rickson’s manner of speaking and his approach to teaching were like no other. I felt like a better person and felt like my focus on life was clearer and stronger after associating with Rickson. This experience for me and the statements by my fellow seminar participants was a clear validation of Rickson’s entelechy and a testament to his greatness. Several years ago I flew from Salt Lake City to Los Angeles. My purpose for this travel was to take a comprehensive aptitude test from an organization called, The Johnson O’Connor Research Foundation. In one of the tests I was timed to see how quickly I could assemble a wooden cube that was cut into different shaped sections. Individuals who rapidly connected the odd-shaped wooden pieces possessed what is termed as Structural Visualization. Structural visualization is the ability to visualize an object (or structure) in three-dimensional quality – to think in lines, curves and angles. Evidence of this ability is displayed through the assemblage of what I was issued, the wiggly cube. Grappling is an unquestionable three-dimensional art. 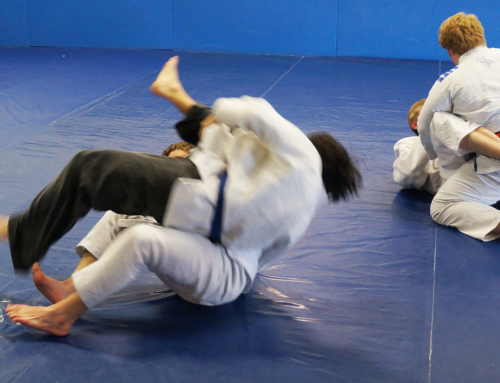 A grappler can start out with knee on stomach, be reversed and be on his back in side-body, then mounted, escape and end up in his opponent’s guard. When Rickson grapples he is undoubtedly assessing his position as well as his opponents with three-dimensional thought. Rickson’s grappling might be more aptly expressed with this analogy: An individual who doesn’t have high structural visualization would only perceive Jiu-Jitsu like a flat jigsaw puzzle. This is still a challenge but it is distinctly different than Rickson’s holographic, multi-percepted approach. Dr. Ben Carson, a world-renowned neurologist, said this in his book Think Big: One special talent that I have been given is hand-eye coordination combined with the ability to think in three-dimensions. Ben Carson’s use of the scalpel within the human brain is enhanced significantly because of his ability to view the brain as a multi-dimensioned structure. Likewise, Rickson Gracie’s Jiu-Jitsu prowess, like Dr. Carson’s operating skill, can probe an opponent for his strengths and weaknesses with delicate and deadly precision and when he chooses, sever the opposition with a choke, arm bar, wristlock, etc. Another source of Rickson’s skill is termed as Bodily/Kinesthetic. This talent defined by Dr. Howard Gardner in his book Creating Minds (also the author of the bestseller, Multiple Intelligences) is the ability to use many parts of the body to express ideas and feelings and to interpret and invoke effective body language. Michael Jordan, Wayne Gretzky, Lance Armstrong and Rickson Gracie would be individuals Dr. Gardner would designate as having extraordinary bodily/kinesthetic ability. I will always remember a seminar Rickson taught in Salt Lake City because Rickson told us over and over that the way we grapple reveals our personality. So, for Rickson, a way of understanding people is not through a verbal conversation but he was able to glean personality types through “rolling.” This information indicates that Rickson’s body, functions as antennae for the brain. And as Gardner states, this knowledge could only be acquired through the body. Bruce Lee may have had this same type of highly refined Bodily/Kinesthetic intelligence. I remember a statement by Dan Inosanto where he spoke about a conversation with Bruce Lee and Bruce said (paraphrasing), “Dan, the secret is in the body.” It is no secret the Bruce Lee was hyperactive and his emphasis on “swimming in the water” and experiencing true reality was foremost for him. I hear and forget. I see and remember. I do and I understand. The operative word “do” suggests that learning something is not just through passive understanding (reading, conversation, watching others) but also through the physical act of doing. A noted Brazilian Yoga master, Orlando Cani who has trained numerous Brazilian sports champions (Rickson included), spoke about Rickson’s bodily/kinesthetic intelligence in this way: Rickson is special. Rickson Gracie was the best student I had. He was the one to assimilate best the process. He’s a very special fighter. Everything he learns he has a strong ability to assimilate and develop it. He has a clever way to assimilate and protect anything he likes. In conclusion, an appropriate quote by Shakespeare states: Some are born great, some achieve greatness, and others have greatness thrust upon them. I would assert that Rickson’s path to greatness was that he had a father whose single-mindedness and fanatical attention to detail was passed directly to his son. And when speaking of Rickson Gracie’s extraordinary Jiu-Jitsu skills we might envision that when Rickson is grappling he sees Jiu-Jitsu in a three-dimensional world. This capacity allows him to spar, not only from his viewpoint but also from other viewpoints. Thus, a three-dimensioned view. And finally, Rickson’s supreme body-intelligence enhances his understanding of Jiu-Jitsu and is gained from the body having superb skills of sensitivity, adaptability and kinesthetic perception that are gleaned physiologically rather than cerebrally. This then is the difference between being great and Greatness.